The Kensington KeyFolio Pro Performance Keyboard Case for iPad 2 Wireless Keyboard is another solution to make typing and working on the iPad and iPad 2 more comfortable. It's a far more successful attempt than the Logitech Fold-up Keyboard for iPad 2, since not only is the keyboard firm and sturdy, it's also included in a protective folio case that keeps the iPad safe from scratches. It has been well designed to include gaps in the case for easy access to the iPad's ports, and includes holes for the iPad 2's camera. Frustratingly, a number of other cases neglect to include these holes, meaning that we had to remove the iPad before using the cameras. 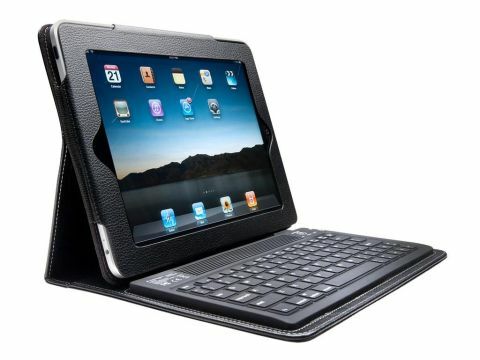 Not so with the Kensington KeyFolio Pro Performance Keyboard Case for iPad 2 Wireless Keyboard. The iPad can also be easily rotated within the case from landscape to portrait. As you'd expect from a Bluetooth device, setting the keyboard and its case up and pairing it with an iPad 2 is very simple. The keyboard feels great to use, with the buttons being big enough to type on comfortably without increasing the overall size of the keyboard.